I brought my ” almost done” The Spaces Between VI to my small critique group (Judy Dales, Marilyn Gilles, Christine Fries). Although it has been at times helpful in the past, I rarely bring in unfinished pieces. Sometimes getting outside input throws me off my own direction and it doesn’t feel “mine” anymore. The other women in this group are MUCH better technically than I and have more of a solid sewing background. I tend to just experiment (flail around) till something kinda works. 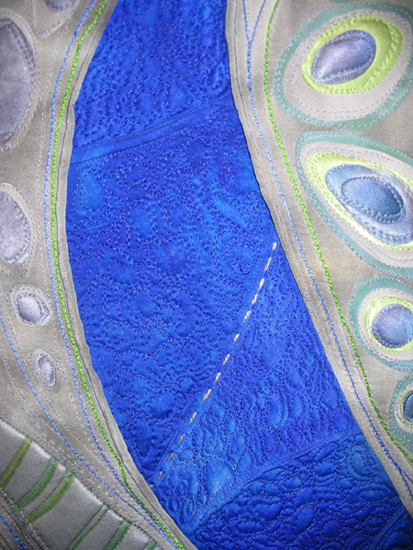 The recommendation from the group was to use a stabilizer behind the blue and densely stitch- pulling in the extra loose fabric and making it FLAT. I’d never used stabilzer before but I went out and bought a few yards. 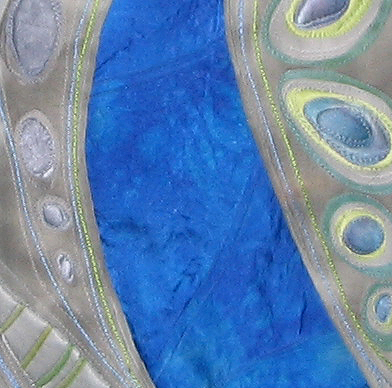 Stitching through silk and a stabilizer was dreamy-like a hot knife through buttah! And the result makes me much happier with this piece, in fact very pleased. By pulling the blue flat the 3-d-ness of the larger gray areas is more pronounced which is what I was aiming for. I’m ready to finish the edges in the next few days. Then a label and sleeve for hanging and this one will be done. This entry was posted on February 1, 2010 at 10:26 am and is filed under Process. You can follow any responses to this entry through the RSS 2.0 feed. You can leave a response, or trackback from your own site.